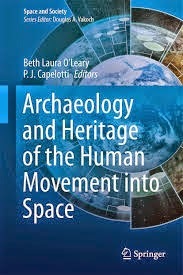 The Handbook of Space Engineering, Archaeology and Heritage, edited by Ann Garrison Darrin and Beth Laura O'Leary, has been nominated for an Emme award. 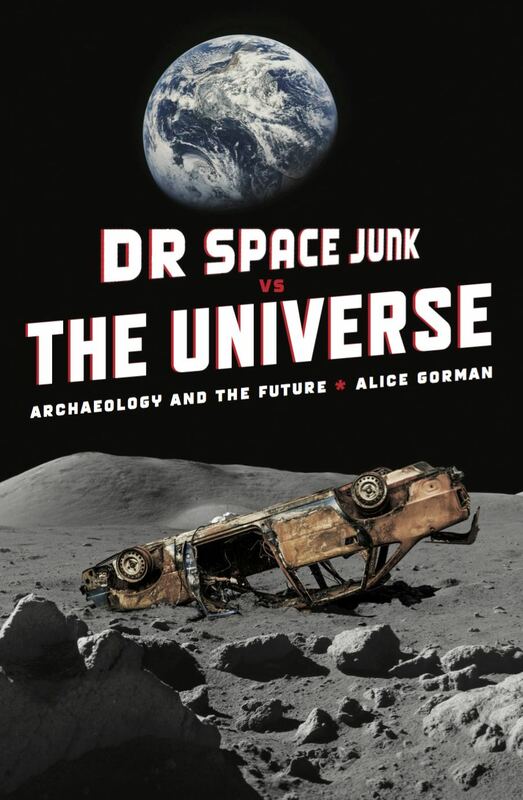 The annual Eugene M. Emme Astronautical Literature Award, named for NASA’s first Historian, recognizes an outstanding book that advances public understanding of astronautics. 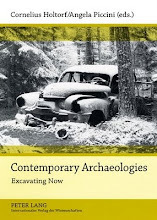 It rewards originality, scholarship and readability. Congratulations to our wonderful editors! Last night I gave a talk for the Canberra Archaeological Society about the Orroral Valley Tracking Station in the ACT. I reported, with the assistance of my elegant geophysical friend Ian Moffat, on the results of the magnetometer survey we did in February. There were several subsurface anomalies that were not correlated with any visible surface features. An old Orroral staff member present at the talk was able to tell me that one of them was where the remains of the Baker-Nunn camera infrastructure were buried. I talked a lot about horn antennas, which I am finding increasingly fascinating. Up until now, I have created a few boundaries to define my research interests - a necessity, so that one doesn't get distracted from the main game. Pretty much, I have decided that I start at 1936 (Peenemunde) and only do space - so not sites associated with pure astronomy. Of course it's not as simple as that, I'm well aware that there is much overlap between space sciences and astronomy, but it's worked pretty well until now. But with tracking stations, I'm now looking at things which are antenna, telescopes, and aerials all at the same time. Many paraboloid antennas were recycled/reused in radio astronomy (so really it's a nature/culture divide, isn't it - it's an antenna when listening to human signals, a telescope when listening to non-human signals). The design is starting to interest me more, and the co-development of radio astronomy and spacecraft tracking. So I may have to rethink my research parameters. UK researchers have developed a device to drag space junk out of orbit. They plan to launch a demonstration of their "CubeSail" next year. It is a small satellite cube that deploys a thin, 25-sq-m plastic sheet. Residual air molecules still present in the spacecraft's low-Earth orbit will catch the sheet and pull the object out of the sky much faster than is normal. The Surrey Space Centre team says the concept could be fitted to larger satellites and even rocket stages. The group also envisages that a mature system would even be sent to rendezvous and dock with redundant spacecraft to clean them from orbit. "Our system is simple and very low cost; but we need to demonstrate that it can be done," said Dr Vaios Lappas, lead researcher on the project and senior lecturer in space vehicle control. "It would help make space a sustainable business. We want to be able to keep on launching satellites to provide new services; but unless we do something, the amount of junk up there is going to grow exponentially." It is thought more than 5,500 tonnes of junk now clutters the region of space just a few hundred km above our heads. Last year, two satellites even collided, showering their orbit with tiny fragments that now pose additional risk to operational spacecraft. International agencies have agreed that retired hardware - old satellites or spent rocket stages - should be removed from space within 25 years of the end of service. Using large deployable surfaces to increase the drag on these objects so they fall to Earth rapidly is one possible solution to the space litter problem. CubeSail, unveiled on Friday, is a 3kg (6.6lb), 10cm x 10cm x 30cm (4in x 4in x 12in) nanosatellite. It incorporates within its tiny frame a polymer sheet that is folded for launch to be unfurled once in space. The simple deployment mechanism features four metal strips that are wound under tension and will snap into a straight line when let go, pulling the sheet flat in the process. The team hopes to launch its demonstrator at the end of next year, riding piggy-back on another mission or as part of a cluster of small research satellites that are sometimes lofted en mass atop a single rocket. The nanosat will then circle the Earth, going from pole to pole at an altitude of about 700km (435 miles), testing its systems and assessing the drag principle. If successful, CubeSail could become a regular add-on system to satellites and rocket stages, opening up a new space business akin to the daily refuse services here on Earth. "We would be looking to put it on our own satellites and to put it on other people's spacecraft as well," said Sir Martin Sweeting, the chairman of SSTL, the world-leading small-satellite manufacturer, which is supporting the research. "We want this to be a standard, essential bolt-on item for a spacecraft; and that's why it's very important to make it small, because if it's too big it will interfere with the rest of the spacecraft," he told BBC News. The researchers hope to develop the project as a propulsion system as well. The pressure of sunlight falling on such a large structure would also move it. The force is tiny but continuous. This "solar sailing" technique has long been touted as a means of moving spacecraft around the Solar System, or even just helping conventional satellites to maintain their orbits more efficiently. Indeed, some of the large geostationary satellites, for example, already use solar-sail flaps to maintain their attitude without firing their thrusters. This saves valuable chemical propellant and extends mission lifetime. CubeSail will endeavour to demonstrate this "propellantless propulsion" by trying to shift the path it takes across the surface of the Earth by just a few degrees over the course of a year. To do this though, the nanosatellite will have to carefully control the angle of the sail with respect to the Sun, just as an ocean vessel has to play with its sails to catch the wind. "We're going to control our sail with a very novel geometric technique; we're not going to use any thrusters," explained Dr Lappas. "We have developed a tilting mechanism that uses very tiny motors. It's able to move in two directions. This enables you to change the centre of mass of the sail. We're also going to be using small magnets to control the sail because they will interact with the Earth's magnetic field." Once its mission is complete, CubeSail will be instructed to take itself out of orbit. The project is a private venture within the Surrey Space Centre, which is based at the University of Surrey, Guildford. CubeSail has been funded by Europe's largest space company, EADS Astrium, which is one of the world's biggest manufacturers of satellites. It also produces Europe's heavy-lift rocket, the Ariane 5, which launches about half of the world's commercial satellite platforms. The entire cost of the project is expected to be no more than £1m ($1.5m). 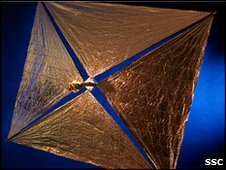 Other groups around the world are expected to launch solar sail demonstrators soon. The US space agency has been working on a project with The Planetary Society, a long-time proponent of the technology. The Japanese, too, have work in progress. And even Astrium is sponsoring other space junk mitigation strategies within its own division. Orroral Valley Tracking Station, and Australia's new space initiatives. NASA's Honeysuckle Creek tracking station near Canberra received the world's first images of the Apollo 11 moonwalk in 1969, but staff at nearby Orroral Valley tracking station enjoyed a private viewing of the event. They swung their 26m dish antenna on to the moon and got their own pictures, according to a former staff member. "We weren't actually tracking anything, so we had a look at it," Philip Clark tells the HES. He was an electronics and radio communications technician at Orroral, 50km south of Canberra in Namadgi national park, when Neil Armstrong and Buzz Aldrin took their first steps outside the lunar module. "It was for our interest only," says Clark, who was later promoted to senior operations supervisor of the facility, established by NASA in 1965 to track near-Earth-orbit scientific satellites. Clark was one of a small group of Australians in the space race at the height of the Cold War. Australia was a space power in the 1960s, at the forefront of satellite and rocket technology, and the site of ground stations to track and communicate with spacecraft exploring our solar system. But Australia's foray into the final frontier is now so long ago that it is the stuff of archeology. A research team led by Flinders University archeologist Alice Gorman will soon start digging the Orroral site. Australia remains a world leader in astronomy. But that discipline is not normally classified within the fields of space science and engineering, which encompass satellite technology and space exploration. Experts warn that Australia's decline in these areas is costing us dearly and putting our national security at risk. Now the space industry is being relaunched by the federal government. The big question is whether it will stay in orbit. When Australia launched WRESAT-1 from the Woomera rocket range in South Australia in 1967, it was only the fourth nation to launch a satellite and the third to launch one from its own soil. But a British satellite launched just four years later aboard a Black Arrow R3 rocket was the last satellite to blast off from the desert site. Australia owns no satellites. 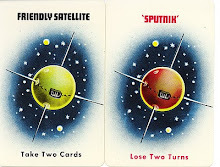 Optus has several communications satellites but they are owned by Singapore Telecommunications. The global market for commercial satellite-based products and services is estimated at more than $100 billion a year, according to the report of a Senate inquiry into Australian space science and industry. Released in 2008, the report, titled Lost in Space, says the use of satellites for Earth observation is "the most important commercial aspect of space for Australia". Australia is a heavy user of satellites but has "very limited national capabilities" in the technology, Australian National University earth and planetary scientist Marc Norman tells the HES. "We use data from European, Japanese, American and Chinese satellites to do everything from predicting the weather through navigation, to carbon accounting, minerals exploration, stopping terrorists and preventing the spread of quarantine pests," Norman says. He is a member of the steering committee of the Australian Academy of Sciences Decadal Plan for Australian Space Science. "We depend on our international partners to provide the data which, in some cases, is essential to our national security. That's not a very strong position in an uncertain world." Meanwhile, although Woomera is still used for rocket testing, it has fizzled out since the days when it was central to British and US programs. Australia still plays a key role in the support of space exploration, however. NASA recently announced plans to install two new dish antennas at the Canberra Deep Space Communication Complex at Tidbinbilla. The facility is part of NASA's Deep Space Network, which communicates with space probes. But Australia once hosted several NASA satellite tracking stations, including Orroral, Clark says. Now only two facilities remain, in Alice Springs and Dongara, Western Australia. Much of Australia's early involvement in space was driven by its geography, with foreign powers needing to site facilities here. Australia's sparse population also made it an attractive site for ground segment operations, Gorman tells the HES. Strategic factors also played a part, she adds, with Australia expecting access to defence technology through joint operations with Britain and, later, the US, she adds. When those countries wound back some activities, successive governments did not fill the gap with a strong, independent space program. The Rudd government has introduced programs to build national space capability. Last month it announced about $12 million in grants in the first of four funding rounds of its four-year, $40m Australian Space Research Program. Among projects funded was research led by the University of Queensland that could deliver an air-breathing, hypersonic combustion scramjet engine for use in a satellite launching system. The Australian Academy of Science estimates it would take an investment in research of $100m for 10 years to rebuild capacity in the civil space sector. The government is on track to meet that target as long as it maintains its present level of funding. Innovation,Industry, Science and Research Minister Kim Carr tells the HES the government will consider future funding levels after evaluating the latest initiatives. He points out the government has also invested $8.6m across four years in a new space policy unit within his department to co-ordinate space activities. "It [space] is not an abstract sideline for people interested in weird and wonderful things," he says. "It's about making sure that this country stays at the cutting edge of technological development." After drifting without a space program under the Howard government, the scientific community has welcomed the initiatives. But Norman says the investment is low by international standards and the government will have to keep up the momentum. Much rides on private-sector participation, he says. Australia tried to get back into space in 2002 with the launch of FedSat, a 50kg research satellite designed by the Co-operative Research Centre for Satellite Systems. The $25m project delivered good scientific results and briefly built capacity in space technology. But the CRC closed in 2005. It failed to meet expectations, perhaps unrealistic, that it would propel Australia into satellite design. FedSat's signal failed in 2007. 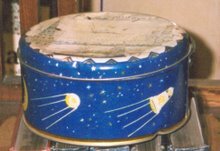 The microsatellite was carrying a CD with a recording of the Paul Kelly song From Little Things Big Things Grow, the battle cry of the champions of lost causes.